I have been fascinated by adults my whole life. I spent most of my childhood years at the adults table, eager to have the freedom of choice that came with being grown up. I was a 40-year-old woman in a 9-year-old’s body. Flash forward 15 years and I’m still waiting for the illustrious feeling of adulthood. What I’ve found is monotony, confusion, and the instilled American value of feeling behind. I’m 24 years old and I don’t know who I am or what I’m doing. I get tripped up on polite conversation starters such as “what do you like to do” or even “what do you do for a living”. I live in a house (my fiancé’s), I have a cat. I eat three meals a day and I exercise. I’m not in debt and I brush my teeth every morning. But, I still don’t feel like an adult. Around a year ago, I took interest in ways to feel more grown up. I had a constant playing loop in my head whispering “you have to get it together“. I never knew what this “it” was, but I had a feeling of immaturity and doom. Like I realized that I wasn’t 16 anymore and that decisions I make in my twenties will affect the rest of my life. Meg Jay has an excellent TedTalk on the science behind this. You can view the video here. What I’ve come to realize is that it wasn’t these huge life milestones that made me feel like an adult. It wasn’t when I got engaged, it wasn’t when I was arguing with my fiancé over shower curtains in Bed, Bath, and Beyond. It wasn’t when someone called me “ma’am” for the first time. It was self-motivated and changes I made myself to improve my life that made me feel like I had my sh** together. 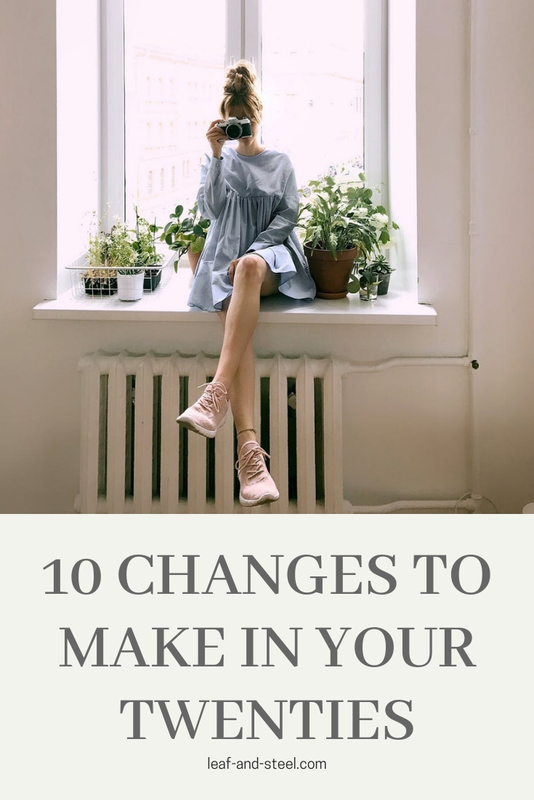 I’ve listed 10 of these small, but monumental changes below. I got my financial house in order. I put more than $5 in my savings account. I found out where my money was going. You are never too young to start saving for retirement, a house, or a security fund. Even saving as little as $20 a week could leave you with over $1,000 a year. This is one of the greatest things I’ve ever done for my self-esteem. Starbucks, luxury goods and movies are great, but nothing can buy the feeling of security that comes with a savings account. I remembered my manners. Now, my mom is an etiquette instructor, so it’d be hard for me to forget my manners. I took my elbows off the table and put my napkin on my lap and sat up straight. Although my life is not a culmination of others’ opinions of me, it says something to behave like a proper adult in social situations. I ditched the sweats. I used to wear sweatpants basically anywhere that wasn’t a social gathering. It was just easier. I purchased a very comfortable pair of jeans and took the extra thirty seconds of brain power required to put together an outfit. I also laid out my clothes the night before. This matters simply because when you look good, you feel good. I keep addresses and write down birthdays. No more relying on my moms messages saying “text your cousin, it’s so-and-so’s birthday” or scavenging for addresses. I kept notes in my calendar and promptly wished friends and family happy birthday, or was able to remember important dates like anniversaries. This is a huge part of maintaining relationships with those close to me. I stock up. I stocked up on toilet paper, toothpaste, cat food, you name it. No more late night runs to Target or trying to do without shampoo. This helped me become the CEO of my household and budget better. I stay out of the sun. My goodness, this one is so important. I stopped tanning in tanning beds and laying out in the summer without sunscreen. This is a no brainer. When I was a teen, I didn’t care about what I would look like at 40 because it seemed so far away. Now, I plan on living a long (and wrinkle-free) life. I discarded idle friendships. I’m sure this sounds rough. I distanced myself from anyone who wasn’t supportive, loving or kind. I think there is line we all cross when we realize that quality is greater than quantity when it comes to friendships. We only have room for so many people in our life, so choose wisely. I got a routine. I got a sleep routine, a morning routine, a night routine, a chore routine. Having this framework to build my days around has eliminated a great deal of stress that comes with self-care and taking care of a household. I got on a sleep schedule. I did this simply by going to bed at the same time and waking up at the same time. I stopped sleeping until noon on Sundays. I stopped having caffeine in the afternoon so I could fall asleep by ten. It’s better for my health and creates structure. It allows me to be more present in my everyday life by getting the appropriate amount of sleep. I’m learning how to apologize. Learning how to say “I’m sorry” in a timely fashion has been a pivotal change in my life. I think it’s one of the most vital signs of being a responsible adult. Owning my part in situations and admitting when I’m wrong is many times a hard pill to swallow, but one that has improved my relationships with others and my relationship with myself. I know part of the secret about being a grown up is no one truly feels grown up. But, these simple changes have made me feel a little more prepared for what lies ahead. I think knowing yourself and how to take care of yourself is the key to feeling put together. When did you start to feel grown up? Was it a milestone in your life or over the course of time? Let me know below. Previous 30 Rainy Day Project Ideas! When I moved out of my parents house.